Detail : Paul's forty-sixth single. Once again a single including only live recordings, with the tracks on the 7" version both from Palatrussardi, Milan. The A-side once again comes from "Tripping The Live Fantastic", whilst the B-side at this time had been unreleased. 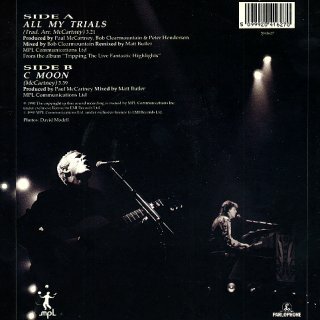 "All My Trials" was recorded 27th October 1989 and "C Moon" was from a sound check before the gig in Milan on 26th October 1989. The same day a CD single was released, and a 12" containing the same tracks as the 7", but both adding "Mull Of Kintyre" and "Put It There". "Mull Of Kintyre" was only sung ONCE during the entire World Tour of 1989/1990 and this (of course ?) was in Scotland, at the Scottish Exhibition Centre in Glasgow on 23rd June 1990 and "Put It There" was taken from the concert recorded on 28th September 1989 in Sweden. One week later another CD single, with a catalogue number of CDRX 6278, appeared with a change of extra tracks. And this time the issue does not also appear on a 12" ... see scans below. 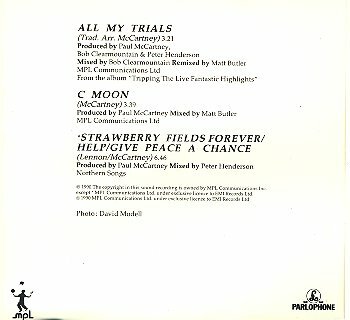 Accompanying "All My Trials" and "C Moon", is a special surprise Paul saved for the fans on his return to Liverpool. 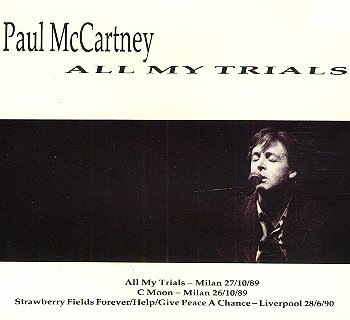 For the first time ever on 28th June 1990 at the concert in Kings Dock, Liverpool, Paul sings a Lennon solo composition, which he couples with two others to make a "John Lennon Medley" of, "Strawberry Fields Forever", "Help", and "Give Peace A Chance" ! The video is an attempt to pull at the heartstrings just before the Christmas period, featuring children in hospital, poor people, and scenes of suffering. 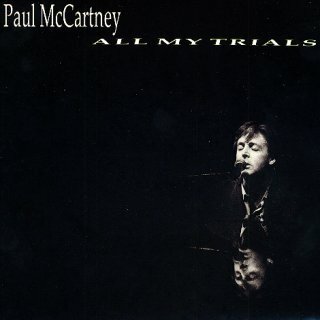 Paul can be seen with his acoustic guitar (also in black-and-white) singing along. It seemed to me there were certain religious overtones in this one. The single was released in a picture sleeve with photography by David Modell.